and can help you decide what type is right for your home. It is amazing how much new flooring can transform a room or your entire home! There are many choices of material type – hardwood, laminate, vinyl, tile – and of course hundreds of options within each category. We invite you to meet with our floor installation specialists to help measure your space, determine the best way to transition to other rooms as seamlessly as possible and the best flooring applications for your space. 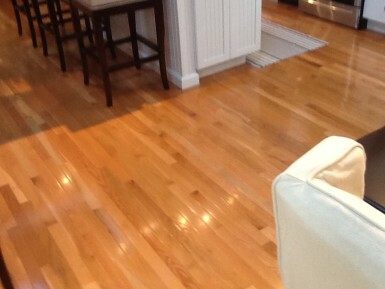 Hardwood floors have changed a great deal over just the last few years. Up until just recently it was widely favored to install unfinished wood and then finish it with polyurethane. The main reason for this was that the joints between the boards would not show as much. But now, with the vast improvement of prefinished flooring, the thought process has changed. There are no noticeable seams and besides the convenience to be able to use the floor immediately after install instead of waiting for coat after coat of polyurethane application, prefinished floors are well suited for long lasting durability. Of course installed unfinished flooring, which is then sanded and coated with multiple coats of polyurethane is still an excellent option, especially if you are looking for flooring over 5” wide or are interested in using unusual or reclaimed wood flooring. Existing wood floors can be brought to new life by refinishing too. They also can be stained to obtain a new look or match a new color scheme. Laminate and vinyl floors are sometimes the best choice depending on the application and budget. Known as floating floors, as they ‘float’ either over your subfloor or sometimes can go right over your existing floor and clicking together like pieces of a puzzle as opposed to nailing directly to the sub floor. A floating floor is the easiest and least expensive option for a basement or split level home where the installation is over cement. A custom tile floor offers endless possibilities and can be installed nearly anywhere. While most commonly used in bathrooms, kitchens and foyers a beautiful tiled floor can be extremely attractive and quite practical in other rooms as well. Deciding what is best for your house or room depends a lot on the sun exposure, humidity levels, condition of your home, species of wood and transitions to the other rooms. We look forward to meeting with you to go over your questions and give you our recommendations.